Yes, the Church is deeply troubled in these times. The problem is sin, the troubles are rooted in sin. And maybe we can say, the problem more deeply is love of sin. But this essay is not about the troubles or the problem; this essay is about the solution. The solution for us personally, individually and together as Church, is finally, simply holiness. Our call, our vocation, is to holiness in Jesus Christ. If we were right with God, all would be well. The Church, including clergy and laity, each and every one of us, is called to holiness. The call to holiness in Jesus Christ ought to be in the mind and heart of every Catholic Christian! Indeed, it ought to be the explanation of why we are Catholic – it ought to be the answer if anyone should ask, “Why are you Catholic?” I am Catholic because God calls us all to holiness, and the one Catholic Church has all that I need to respond to God’s call to me, to be holy as He is holy. This Church has the fullness of divine revelation, the fullness of the Presence of Christ, the fullness of the wisdom, truth and grace that He has entrusted to mankind for the good of humanity: all this He has entrusted to His one, holy, catholic (that is, universal) and apostolic Catholic Church. And to the angel of the church in Laodicea write: “The words of the Amen, the faithful and true witness, the beginning of God’s creation. “‘I know your works: you are neither cold nor hot. Would that you were cold or hot! So, because you are lukewarm, and neither cold nor hot, I will spew you out of my mouth. “For you say, I am rich, I have prospered, and I need nothing; not knowing that you are wretched, pitiable, poor, blind, and naked. “Therefore I counsel you to buy from me gold refined by fire, that you may be rich, and white garments to clothe you and to keep the shame of your nakedness from being seen, and salve to anoint your eyes, that you may see. 1. Scripture. The first disciples of Jesus grew into spiritual maturity in three stages. – In the first stage, when they were following Jesus in His time on earth, they were revealed to be far less than His full intention for them! They did not fully understand the great event of the Incarnation; they struggled against their own unbelief and fear. – In the second stage, after the resurrection, they came to know Jesus in a completely different, deeper way. He was revealed to them now as “My Lord and my God!” He came through closed doors, He showed them His crucified body; He was greater than death! Yet still they were weighted down with fear: still they hid behind closed doors. Jesus ordered them to wait: they were yet to be clothed with power. – In the third stage, they came into the heroic life of witnesses, as was their vocation from the beginning. Following Pentecost, filled with the Holy Spirit, they lived the full life of a Christian. 2. The saints. 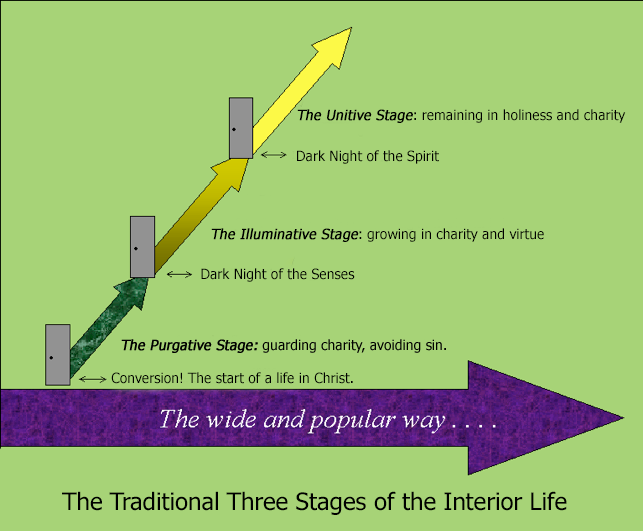 These three stages have been understood by saints of the Church from several different perspectives. St. Bernard, for example, recognized stages of love for God. In the first stage, a person discovers that God is his greatest benefactor, and he loves God for all that God can do for him. – In the second stage, he discovers that this God is good and wonderful in Himself, beyond the good that He can do for us humans. The person begins to love God as God, and not merely as the great benefactor of the self. – In the third stage, The great and infinite goodness and glory of God are seen, and this overwhelms fear and concern for self. The person begins to love others, and even himself, only in God. God is all. St. Thomas Aquinas saw the three stages in terms of the concern of a Christian regarding charity: first to guard and protect the charity that was infused into the soul at baptism; second to increase charity through a life of virtue and good works in Christ; third to enjoy and live and remain in charity in a life of sanctity. 3. Traditional spiritual theology. The traditional terms that have developed to describe these three stages are first the Stage of the Beginner (the Purgative Stage); second the Stage of the Proficient (the Illuminative Stage); third the Stage of the Perfect (the Unitive Stage). This understanding is of real importance to the Christian who is going through any stage! It is especially helpful to a Christian who is in a transition, from one stage to the next! St. John of the Cross, with great precision and insight, helped the Church understand the crucial transitional times in advancing from one stage to the next. The transition times are times of real spiritual crisis. St. John called them “Dark Nights” – the Dark Night of the Senses (corresponding to the experience of the apostles in the Passion), and the Dark Night of the Spirit (corresponding to the experience of the apostles after the ascension and before Pentecost. These are times of great trial for the soul! Every Christian deserves to share in the wisdom of the saints – God gave His saints great graces, that they might bless His people, His Church. My book – now both in paperback and in e-book (the Kindle) is now available in a new 3rd Edition, at Amazon, The Ordinary Path to Holiness: The treasure of Catholic spirituality re-presented for our times. It is an introductory book that I hope and intend will pass on some of this great treasure, this holy wisdom. My prayer is that it be a help for any seeking to find the path, and seeking to grow in the spiritual life toward our common call to holiness, the ordinary path to Him. Yes! Jesus is the Way, the Truth and the Life and our call to Holiness in Him is the solution — if we will follow and keep listening in order to do His Will as our Mother Mary did, so perfectly. She is Mother and Model for the Church given to us by Jesus from His Cross. The example of the Holy Family, and the example of the saints who grew in holiness as you describe in your book, can help us all. Thanks for asking and receiving grace to be faithful to Christ and to His Church, and for your love of His Wisdom shared through Mary our Mother and all the saints. It’s so true, Thomas. Our church needs Holiness! Oh Jesus, create in me a clean heart. Please grant me the graces I need to be a holy daughter of God Almighty. Thank you Thomas for your love of the Church and your wisdom that you graciously share. Thank you again, for another faithful reply! Yes, how truly we all need to pray that the Lord cleanse our hearts, for by Baptism we were made members of His Body and members of one another. As one grows we all grow but when one sins we are all wounded. May the Lord hear our prayers through the intercession of our Mother of Mercy and cleanse us by the power of His Holy Spirit sent to sanctify the Church, bringing us into All Truth! Thank you Thomas for this contribution during this most holy time of the church calendar. I pray that God will direct me every day and that my inspiration will be genuine and not selfishly motivated. My heart cries when human nature causes us to want recognition for our sacrifices. I pray to be a silent warrior and to continue for His cause and His Love, Amen 🙂 God bless you and Deborah and thank goodness we have you guys as guides and mentors. How truly is my desire like yours, to be “genuine” and “not selfishly motivated”! How easily all of us can deceive ourselves!! Yes Jesus wept for Jerusalem and so we must weep with Him for our sins and the sins of the world and in the Church today. May Our Mother of Mercy continue to intercede for us as she is, truly, our Mother given to us by Jesus, helping us to stand with her at the foot of His Cross uniting ourselves with Jesus Who is our Mighty Warrior against the evil one. May we be like Mary, silent warriors in prayer.